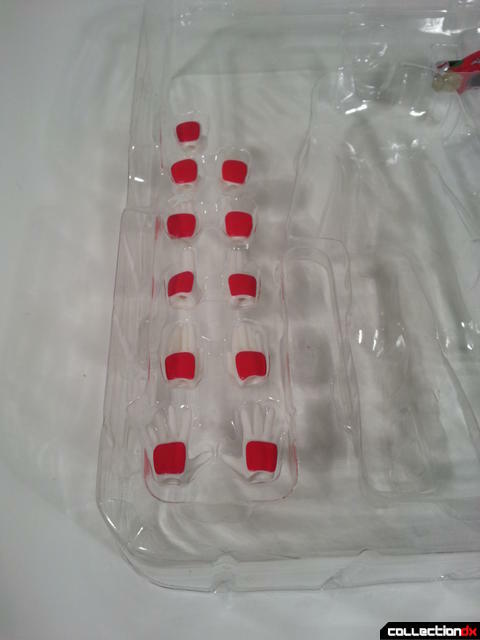 Review sample provided by Bluefin. Available at Amazon.com! 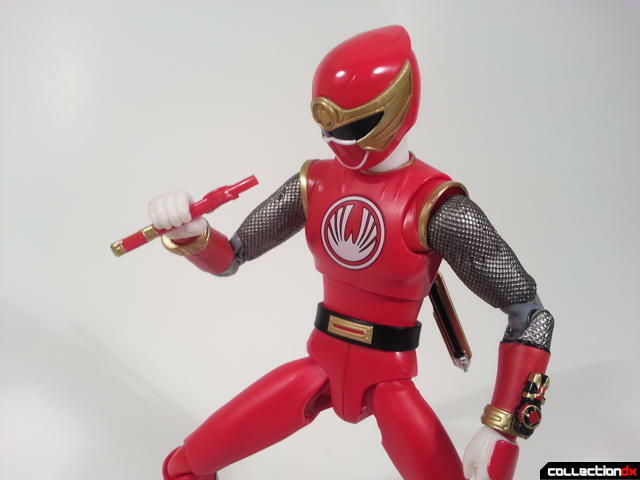 Power Rangers Ninja Storm ended up being one of my favorite later Power Rangers series. I think it was a combination of the neat masked helmets, very awesome mechanical designs, and incredibly blatant public domain sounds used throughout the show. 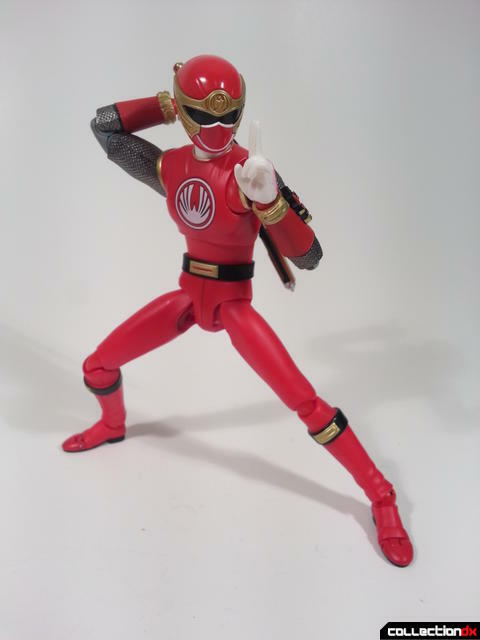 It lent itself to being a very fun and quirky little show that I remember fondly, and it's great to see the series get some love in the form of the SH Figuarts treatment. 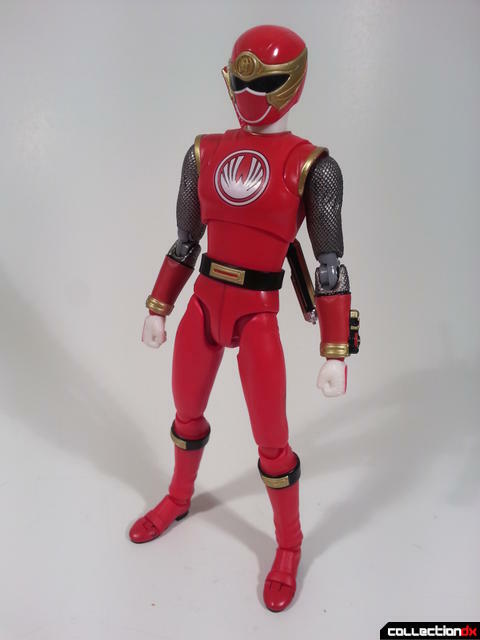 The Red Wind Ranger is the first member of the Ninja Storm team, with the Yellow and Blue coming out very soon along with the Thunder Rangers. I'm super pleased with how this figure looks. The suit is sleek but still filled out. Nothing looks off about it and his proportions and just perfect. 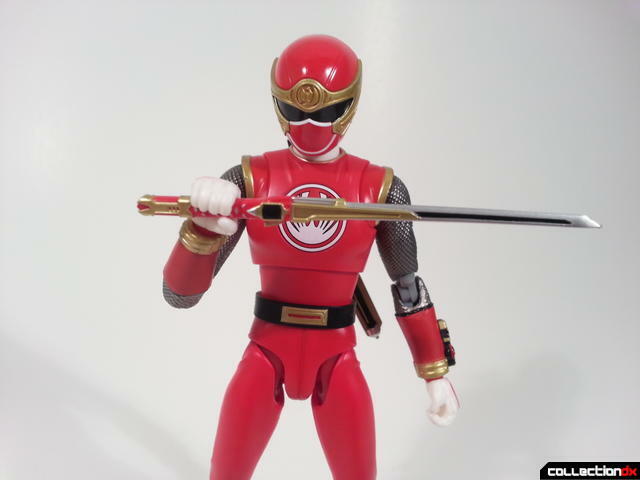 Details like his morpher and symbol on his chest are crisp and well painted. 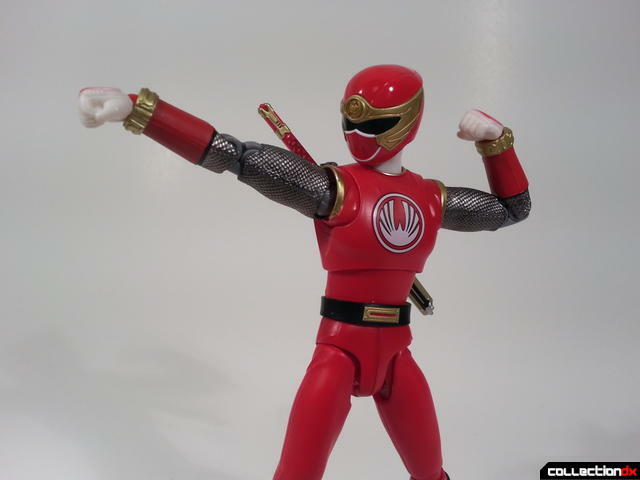 One thing worth noting is that because of the mesh pattern on his arms, the Red Wind Ranger ends up being one of the most muscular SH Figuarts Power Rangers figures yet. Not that he doesn't mind that, or showing them off. 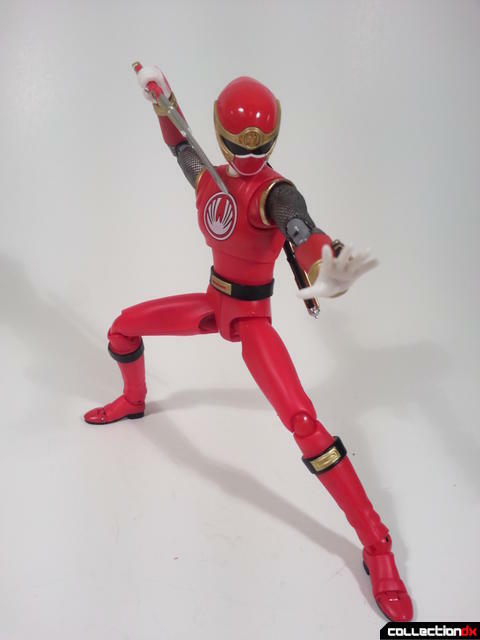 The articulation on the Red Wind Ranger is pretty excellent. 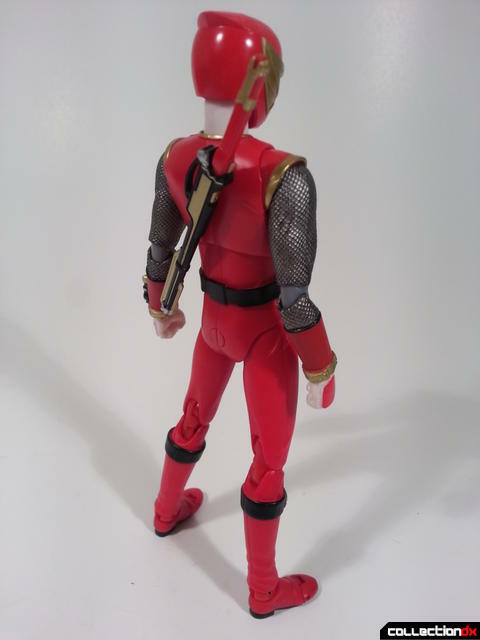 He hits a lot of the standards that newer figures like Red Hawk and SPD Red hit, with a bicep swivel located higher in the arm to maintain sculpt, but without sacrificing mobility in any way. 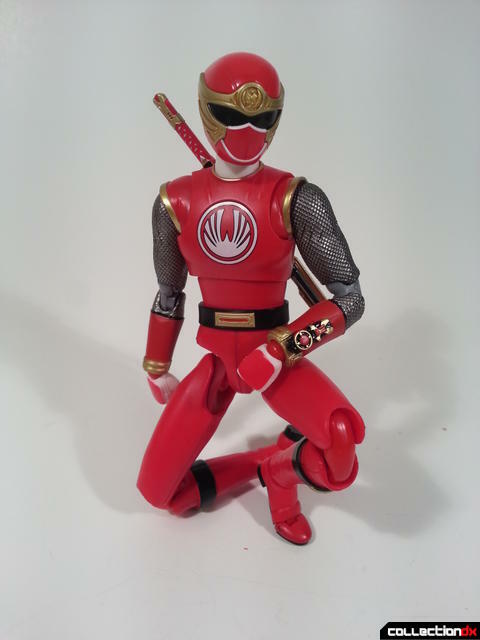 Combined with the newer style of Figuarts hips makes this ninja do everything he needs to. 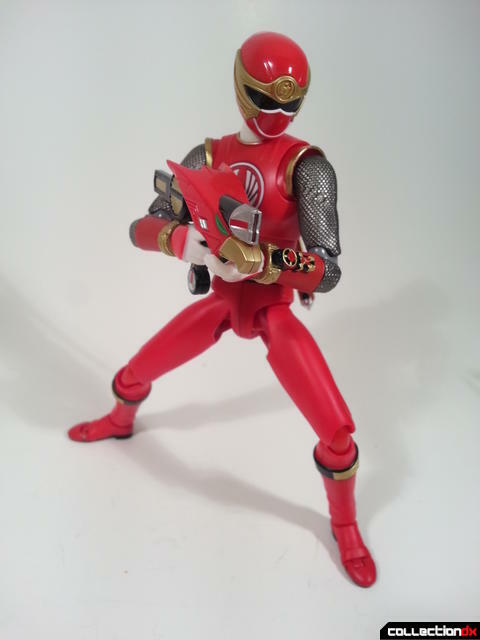 The Red Wind Ranger comes with a huge whack of extra hands and accessories. 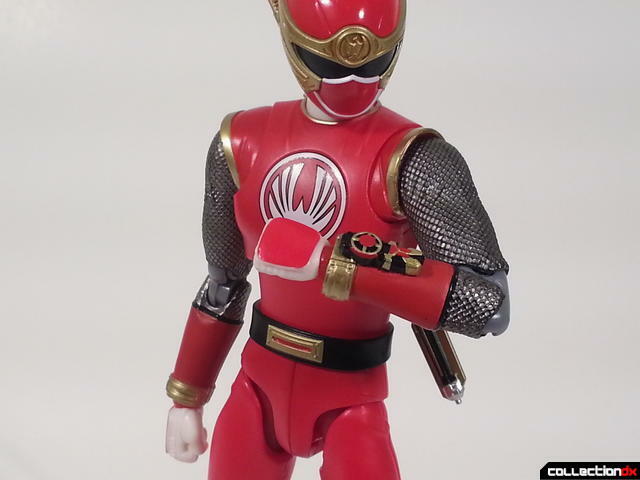 He has 11 alternate hands including open hands, pointing-ninja hands, high five hands, sword holding hands, a gun holding hand, a gun-holding-hand-holding hand, and an angled sword holding hand. 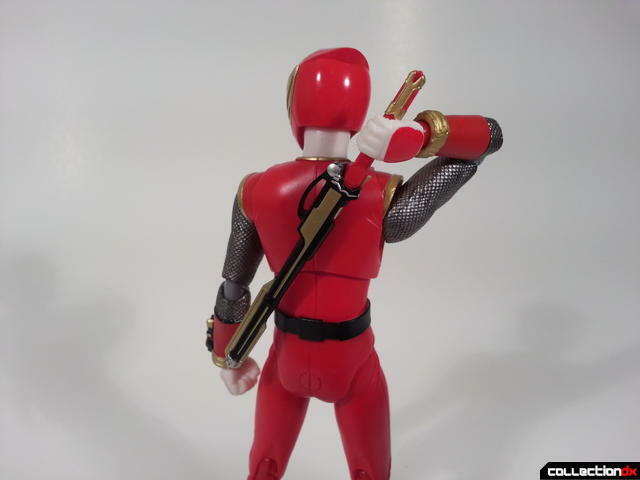 His ninja sword pegs right into his back snug, and the articulation lets him reach around and grab his sword easily. Don't try and pull it out like that though. It'll just end up making him look incredibly silly. 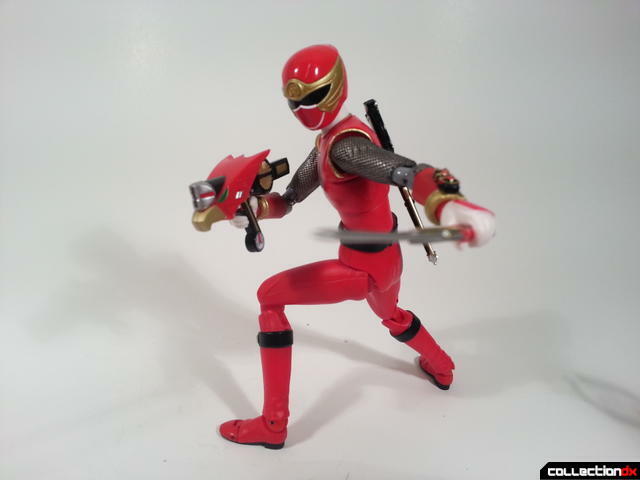 Since the handle alone is removable, you're given a second sword with a blade attached. It's painted with a nice shiny silver paint and is plently pointy due to its sharp sculpt. 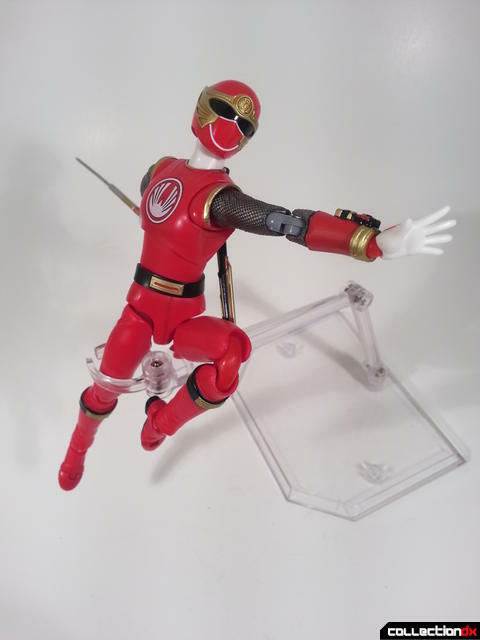 With that and all the extra hands, the Red Wind Ranger can do all sorts of crazy ninja acrobatics. 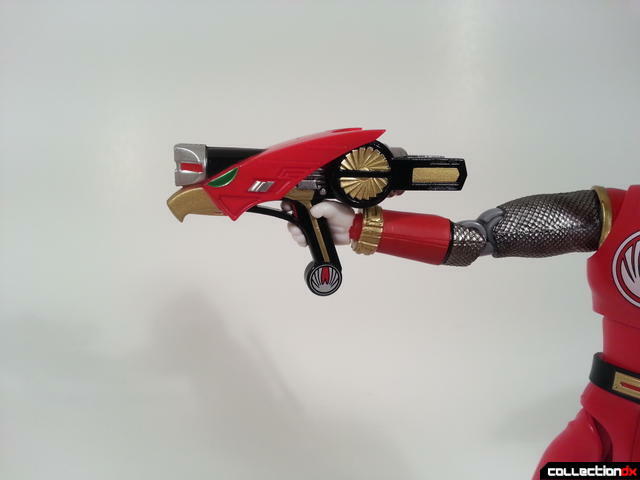 He also comes with his Hawk Blaster, which looks super sharp. 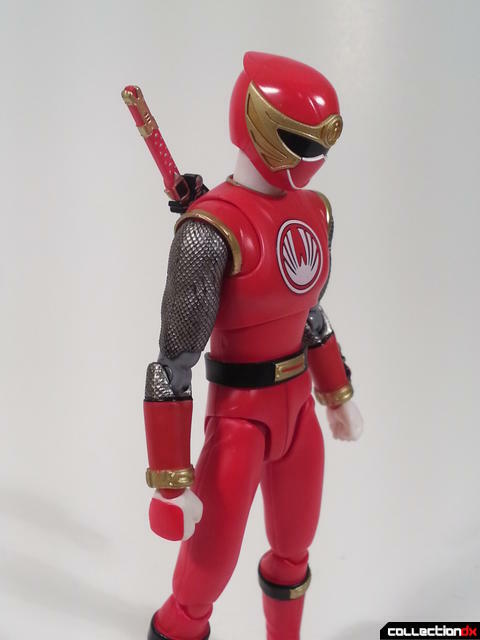 It's an awesome accessory that fits perfectly with the figure, though personally I prefer to display him with his sword. 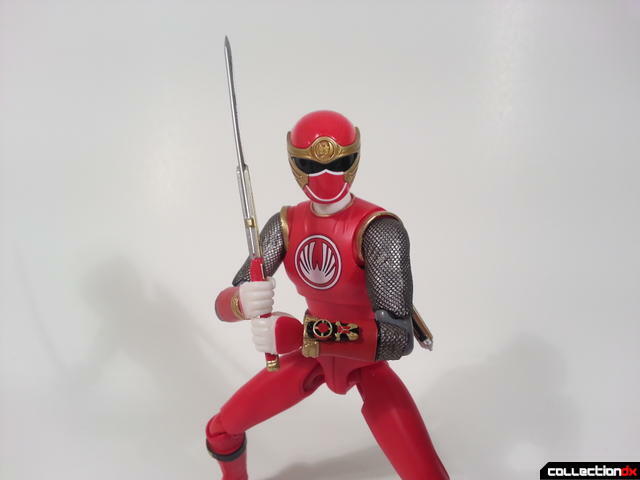 The Red Wind Ranger is a solid first figure for the Ninja Storm team and is a good indication of how the rest of the team will go. 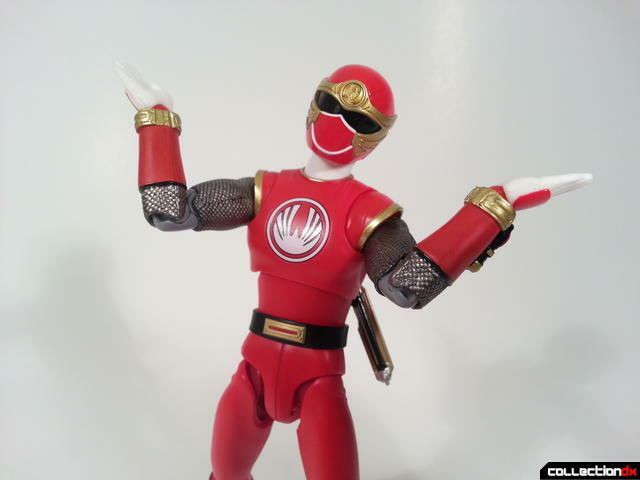 I look forward to having a team of radical teenage ninja Power Rangers in my shelf soon. Is this the american release? If I'm not mistaken I've seen some harness-like accessory in some promo pic. The american release didnt include that? Yes, this is the American release. 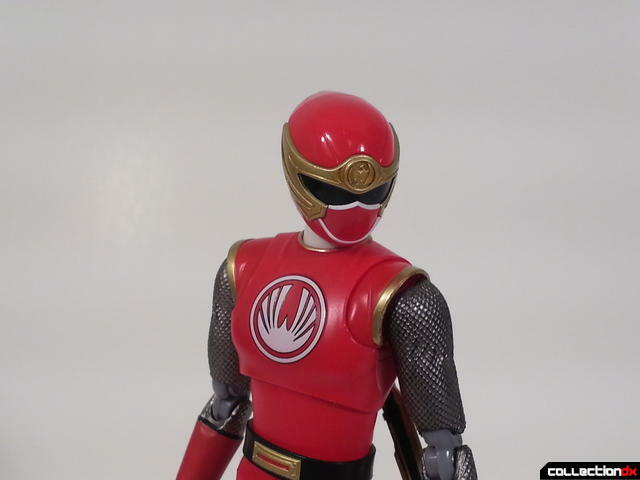 It does not have the extra accessory from Akibaranger.